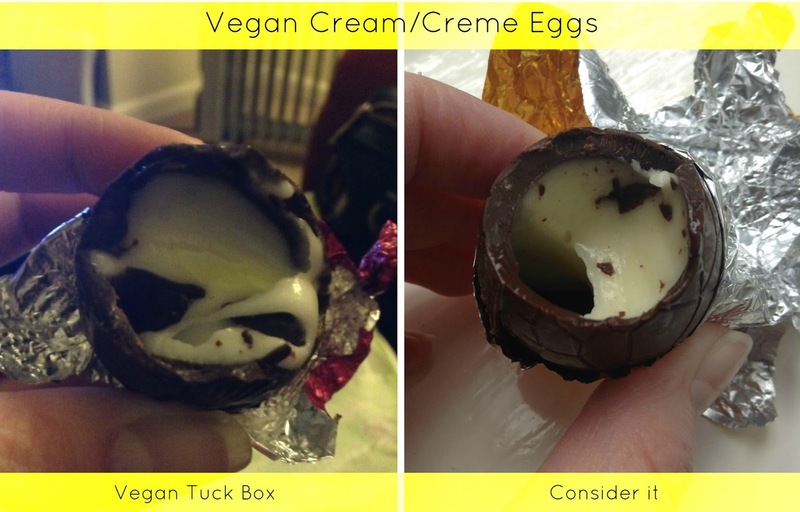 Vegan Creme Egg Crackdown.....It's no yoke! I have tried a Cadbury creme egg, not the wisest of decisions I ever made but I was a desperate fool in my youth. Thanks to the increased popularity of vegan food a whole new world of dairy free treats have become available to me. Every Easter I am making up for lost time by treating myself to a dairy free egg and now I can add dairy free/vegan creme eggs to my shopping list. I bought my first creme egg from Vegan Tuck Box and at a random guess they were probably supplied by The Chocolate Wendy House. The fondant was sweet with a good consistency but the chocolate was a little on the dark and bitter side for my personal taste. The second egg came from Consider It. I am already a fan of their truffle bars having bought from them a couple of times. For me the chocolate on their egg was better quality and a softer taste. The fondant also had a good consistency and a nicer taste than the first egg.